Well, King Goat seem to be doomed for the same fate all over again, like some ghost that cannot move over to the other side. No pun intended – well, almost. Because the same ‘get outta here’ feeling got ahold of the RockmusicRaider deck crew when we finally got around to plug their new album in and start on it. Too much screaming at sound check will not make good music, was the first reaction. But then the record started to take on some volume, a certain unmistakable poise that will get you to listen further. Debt of Aeons definitely carries on where Conduit left off. Abrasive, roughly-hewn and extremely loud in all its metallic splendor, it screamily wanders off into the teary yonder that this band depicts so well. So, in other words, King Goat kept their style more-or-less intact in a world that always wants to change. And this – folks – is actually a good thing. More often than not, bands commit career suicide by the sheer power of their own, misguided leaps of creativity. And usually around the time, when the second album is due. Proof of the pudding follows straight with the parting shot called Rapture. Taking no prisoners, the track’s eerie, yet powerful chanting will really take the cake over all other tracks on Debt of Aeons. At a count of seven tracks – or more 6+ only – a band usually cannot afford any fillers or any other attack of laxity. Yet, King Goat do exactly that with Psychasthenia. A psychedelic something, noodling about the soundscape for I don’t know what reason. Not a feat one should attempt when the track count is so low. Albeit the playtime of the other tracks might prove to be a game-saver. The strength of the tune frankly shines straight from the beginning of the album. The sludge-flavored Eremites Rest confirms this trend after the first song ends after 8 long minutes. Not as good as the first track, this one gets you some real down-turned fury. Complete with two (yep…) solos that egg the listener on nicely. Yet, the second part of Debt of Aeons sees the appearance of some real spice in its midst. A more complex, scratchier and – I daresay – even more pig-headed facet of King Goat‘s tune rears its head in defiance. And that is good news, as just at this moment you get the feeling of déjà-vu, of a certain repetitiveness that is never cool to find on an album. But much to my relief, both Doldrum Sentinels and – for sure – the ten+ minute epic On Dusty Avenues will add some much needed energy and new oomph. Like this infamous progression that we love to hate on tracks. Only – this time – at album scale. King Goat finally took things neatly out of the box. Same as Conduit, this is not a record ‘they’ used to make. No Peaceville Three stamp on any of this, no traditional doom to be found. Pallbearer be gone and we won’t even look at Paradise Lost and the likes. Instead, you get a gnarly and highly intense mix of grungily flavored and sludge-laden Doom Metal with a progressive twist. The near-dud really had no significant impact on the overall outcome. Good news, that. Debt of Aeons sports a sturdy, very noisy and – in a geeky kind of way – refined tune that you will probably need some time to digest. It will however be worth your while, if you are willing to listen. This is a good record. Go for it, by all means. 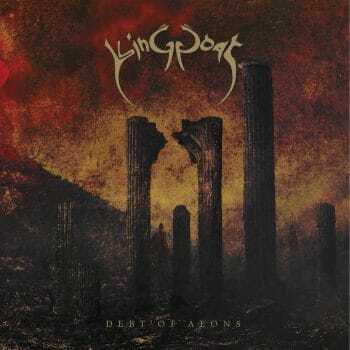 This entry was posted in King Goat, Reviews and tagged 2018, 7/10, Aural Music, Conduit, Debt of Aeons, Doom Metal, King Goat, Pallbearer, Progressive Metal, Review by RockmusicRaider. Bookmark the permalink.